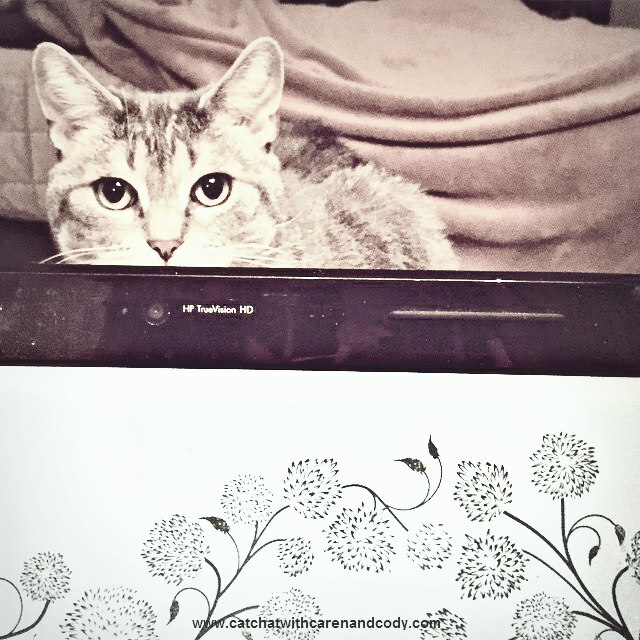 Cat Chat With Caren And Cody: Blogging Cat Wants to know: How Messy Is YOUR Desk? 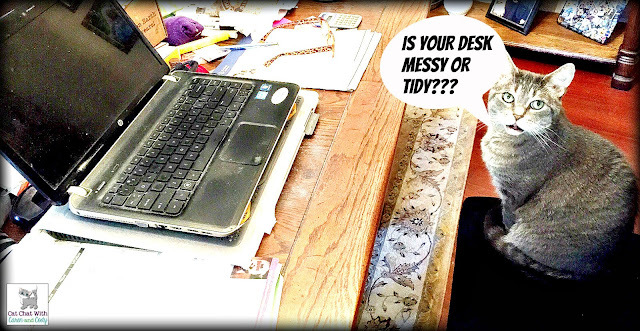 Blogging Cat Wants to know: How Messy Is YOUR Desk? 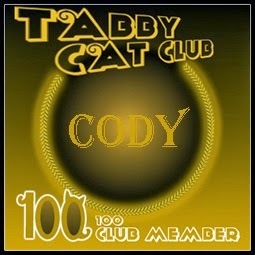 Hi all it's Cody! Today I am so upset that I could just hiss! 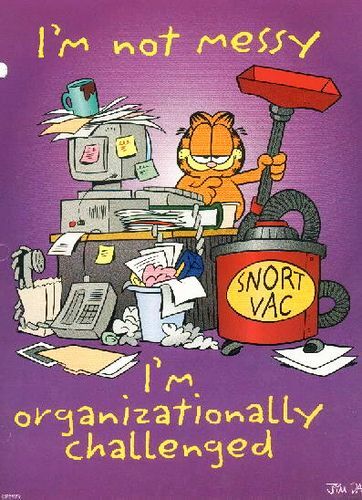 Today is Clean Off Your Desk Day. 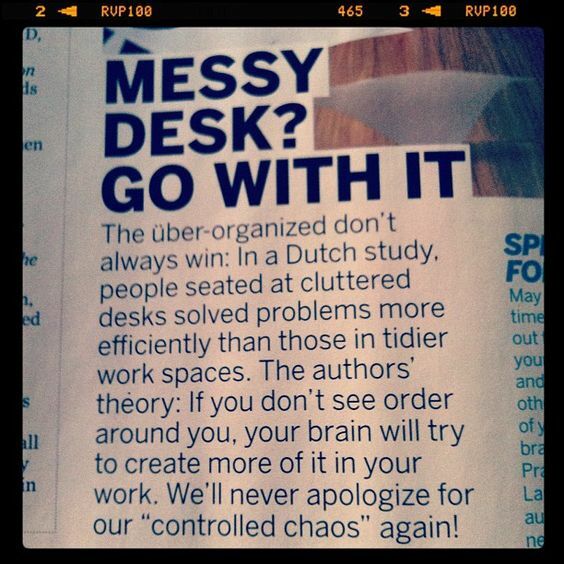 It is a day where humans are supposed to get rid of all unnecessary clutter on their desks!! I think a certain someone in MY house named "Mom" did NOT get the memo. Dad and I are aggravated! Believe it or not, Mom and I HAVE an "office"....Dad keeps threatening to take it over, but Mom won't hear of it. It doesn't make sense because she NEVER uses it! Ok, our office isn't the best looking, it isn't modern, hip and happening, but it is FULL of all sorts of things that Mom loves and many that I love too!!! Now...Mom hasn't worked in this office in so long that I probably cannot count that high. Instead, Mom has chosen to turn the dining room table into her "office." 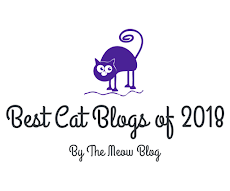 Furiends, I am telling you it is a DISASTER!! When I mentioned to Mom that I am TRYING to understand her illogical reasoning, I start pleading with her to at LEAST clean the dining room table up, she just refers me to these fun photos she found on Pinterest to support her argument that HER desk dining room table, is FINE!! You haven’t seen your desktop in months and your workspace could use some TLC. Start by removing any unnecessary wrappers, papers and trash. Add an air freshener to get rid of foul smells. Label drawers and cabinets to help you stay organized. Consider relocating that old printer or bookcase that is rarely used, in exchange for a closed storage cabinet. 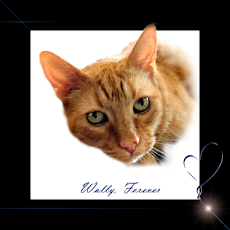 Let me know furiends, also, what is the area where YOU work like? Is it messy or tidy? This kitty wants to know!!! In the meantime, I had better NOT let Mom see this!! My human's whole office is a disaster area! She would like it to be only a fraction as cluttered as it is right now. She is too realistic (and, um, creative!) to think it would ever be tidy. We greatly admire your human, so you made us feel MUCH, MUCH BETTER!! I couldn't function in your Mom's office...LOL! 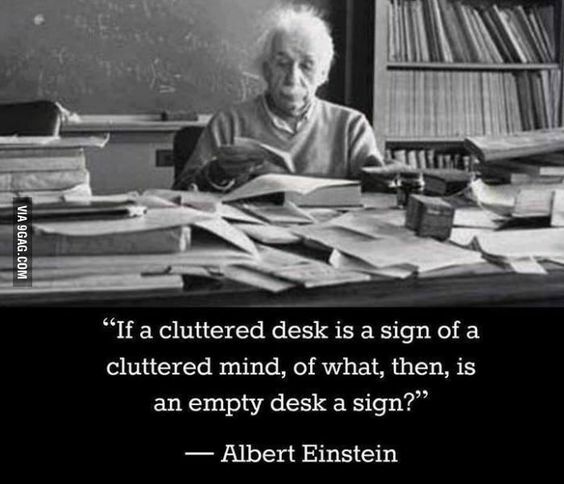 I find a messy desk distracting, but I admire people who can function with "organized clutter." Don't blame you one bit! 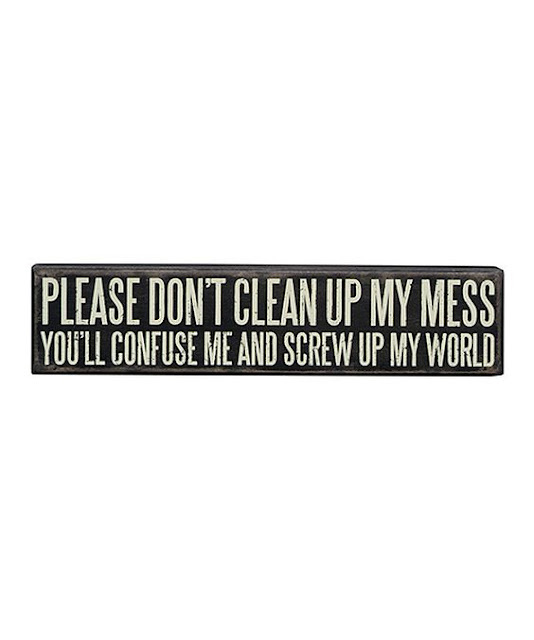 Actually, I am planning on trying to "clean" it all up before the week is out, one can only hope! Oh Cody, your mom and I are soul sisters! I have a beautiful office that I hardly use anymore. It would get cluttered, decluttered, messy, not messy but when Merlin needed me 24/7 I started working in bed. Since he died I still prefer working in bed on a laptop or on the sofa. but at least you have a "beautiful" office that you could use if you wanted to! Actually, mine isn't bad, it's "homey" and full of things I love. I just hate not being in the center of activity lol. 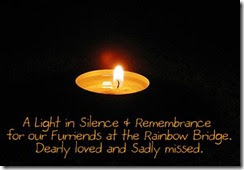 Plus, what I didn't mention, Dakota LOVES sitting on the floor by me when I am on the computer (as I am now), he can't come into my "office" because Cody's toys are all there (we have a babygate in the hallway), and I feel so bad because he will lay in front of the gate missing me. Oh dear! My mom is an organization freak, so the desk isn't too bad. I will say, your mom needs an office she loves if she wants to work in it. 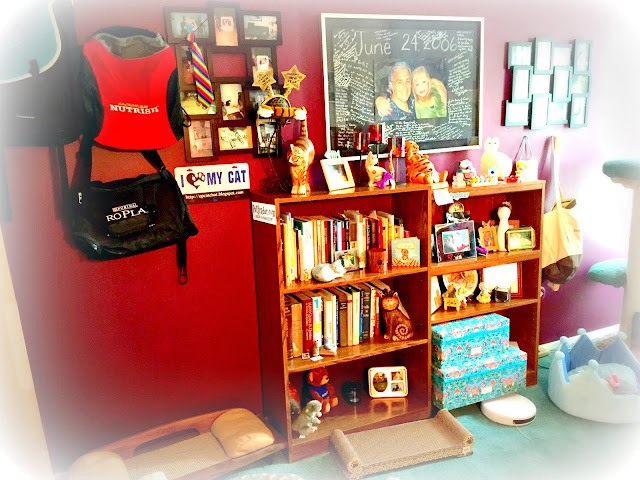 When we set up our office in the front room, it changed everything. Mom spends all her time there and so do we because we love it, we can see everything that is going on, and it is just right for us. Before when it was in the back room, Mom dreaded going there and we didn't go along either. This is ME. I shovel out my office once ever 6 months or so, after finishing a major project. I try to tidy (stacks 'o stuff) but Karma-Kat thinks better in clutter, too, and knocks stuff down. At least...I'm going with that explanation, LOL! Ha!!!!!! Your comment is so ME!!!! Ha!!!!! I will go with your explanation too!!! lol!! Yep, I've got stacks of paperwork and books and stuff (crap) on my desk. At my work office, I am neater because everyone can see it, but there are still some stacks of stuff, not to mention all of the papers pinned to the board. I'm dining room table just has a table cloth on it. Do you want to move here Cody. I'll come and get you if you want to come. The office is a bit cluttered, but all my stuff is in here and no where else in our home. Let me know when I can come get you. Mama is a messy purrson. She says there's order in her madness. She knows where everything is in the clutter. Don't mess with her mess. Nice office! Mum hates a messy office but she isn't very tidy, I must admit. She doesn't have an office though. She prefers to write on the laptop while sitting on the sofa. Our Mom says the only problems solved by people sitting at cluttered desks are people shifting things around to make it look like they are solving problems. Needless to say, our Mom likes a clean-ish desk and that means more desk space for us to lie on. It's a win-win! TIDY? Not in you life Cody, nope, not here! My dining room table is usually like that too with craft projects and stuff, but I had to clean it for Christmas. Now the spare bedroom closet is stuffed with everything. My desk isn't messy--I just have lots of stuff on it that I use regularly (i.e., have used it once within the past 3 years, give or take) or that I like to look at. I couldn't work close to the kitchen--too many distractions! My mum's desk is so tidy that she doesn't have anything on it apart from the mouse, mouse mat and hub! Take a look at the shelves underneath though and they are like a nightmare. She says she can't see it when the keyboard shelf is pulled out so she can pretend it is not there. Oh, Cody, we love your Mom, but we have to side with you on this one. Of course that might be because I have mild OCD and cannot deal with clutter! Cody, the lady works at the dining room table too! She loves your mom's office though and wishes she had an office. Her work area could definitely stand to be more organized. Love all the graphics, especially the Albert Einstein quote! Yay! I am not alone!! So glad you liked it!!! Cody, the mom keeps our office pretty tidy. Though we have some toys and stuff in there to keep us occupied so we don't bother her. Maybe your mom should get a TV in her office so she'll spend more time there and not a the dining room table? Nope! Not an option right now financially. Just got the cable bill from $205 down to $163...not paying for another box right now, no way! Our mom's desk is messy, yet she claims to know exactly where everything is. It does have a strange logic to it. Our dad's desk is very neat and organized. I like your office Cody. Too bad that your Mum don't use it. There is a room with a desk in the house, but nobody really use it. My human prefer to seat on her bed when she uses her computer. She also use the dining room table. She is a real messy person. You make a compelling argument, Cody! I hope that you were able to convince your mom to get things in order around YOUR office. :) I am constantly having to clean off my desk. My whole apartment looks like a hoarder house. Humans are clutter bugs, I guess! "hoarder house" now THAT'S funny!!!!! 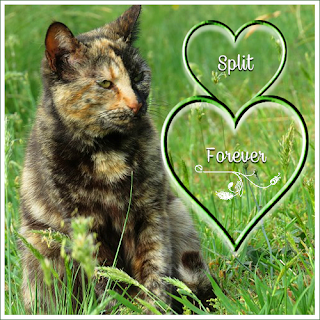 MOL MOL MOL!! MOL!!! Oh, what you have to deal with, poor Cody. 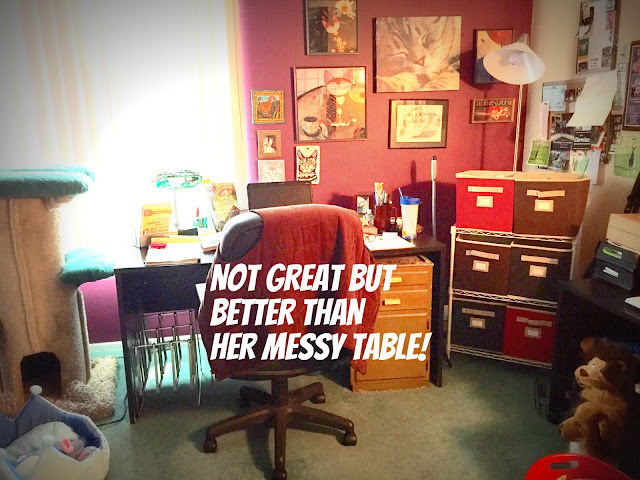 My desk is pretty clean, but my dining room table isn't! How in the world are you supposed to lay on that dining room table? Sheesh! Our mommy has to keep her office desk and the dining room table clear on at least most of it so we can sprawl across it. We work in her office as CPA Cats and then we snoopervise beady goodies on the dining room table. We must have space to lay down and think! My desk goes in weekly cycles - mail, bills, receipts, crap get put in stacks (or kind-of stacks), then I tackle them and have a clean desk again. If the mailman would stop bringing bills, I would have a very clean desk! It's a rule of cat nature that a cat will sit on anything a human is working on. I have a desk my computer sits on with a bunch of drawers. The top left drawer is always open and contains a towel to try to provide a proper cat bed and prevent keyboard sitting. Of course this is futile. I love the company but hate it when the cats walk across a wet watercolor palate adding their own details to paintings. 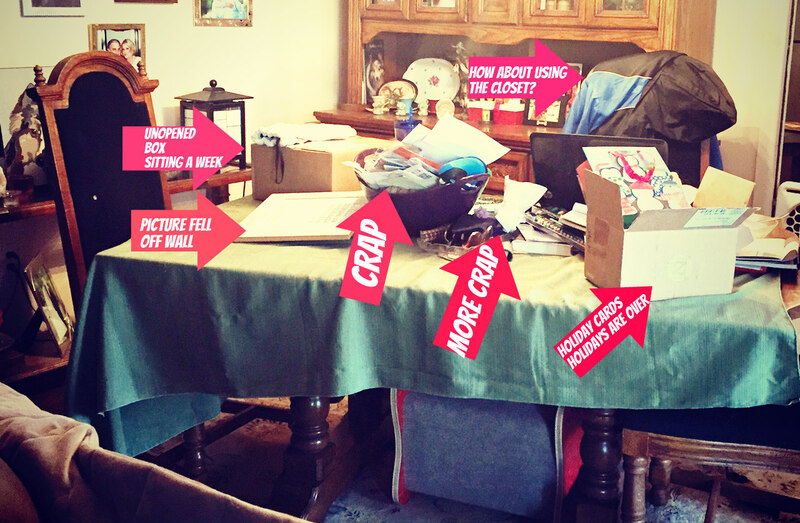 I'll tell you Cody, TW's "desk" which is really Pop's desk is a mess but it's 97% Pop's stuff. TW works off a teeny end of the desk which barely has room for the keyboard and mouse pad. HOWEVER, she has the kitchen table crapped up with old newspapers that she SWEARS she'll read someday "when she gets a spare minute. There are so many 'offices' in our den that we can hardly decide which is the offurcial one, MOL!! 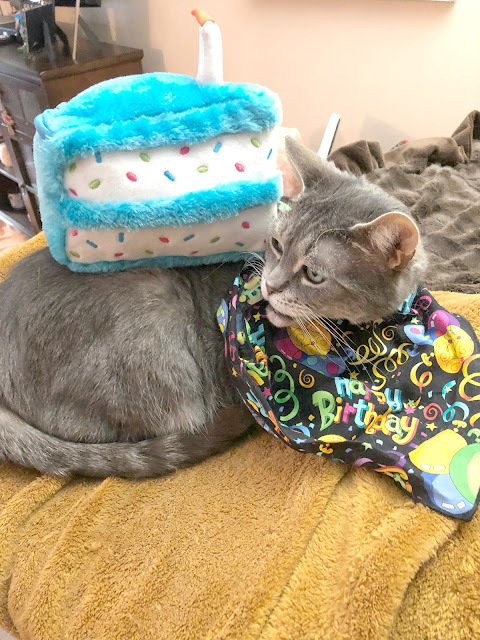 Even pawppy who has the so called front office room (the parlor in older days...) has all kinds of piles of junk, exercise equipment, clothes and books gathering the many dust bunnies we make, because its about impossible to clean that room up. Petcretary does sit at a desk...but sometimes its hard to find the confuser on it,MOL! 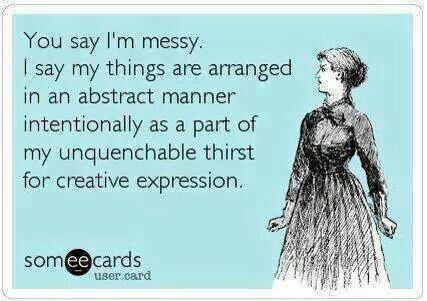 Yup, we'll go with messy! WOW, that IS a messy desk! MOL! 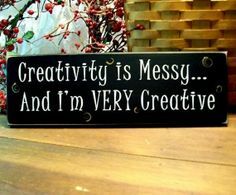 It looks like my husband's work area - he is the messy one around here! I banished him to work only in the basement, as I couldn't stand the clutter he created all over the place! MOL! Good luck, Cody!!! !